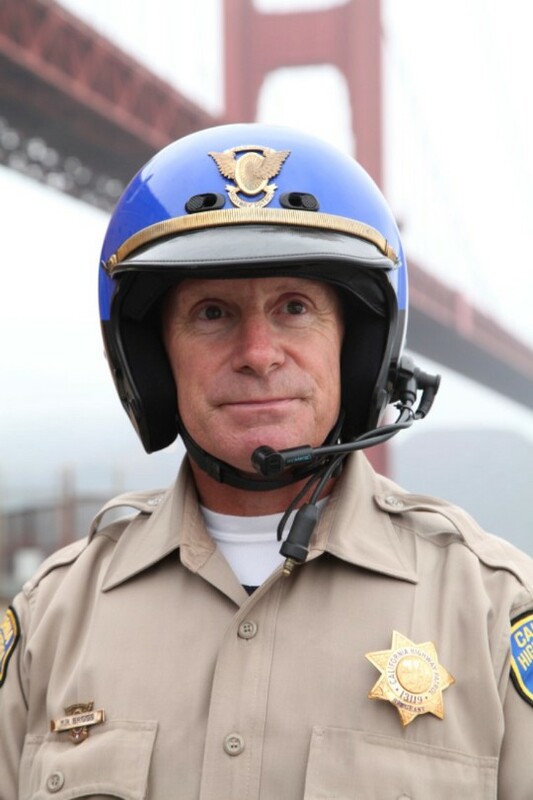 Steve Whyley sat down with Sergeant Kevin Briggs (also known as the Guardian of the Golden Gate Bridge). 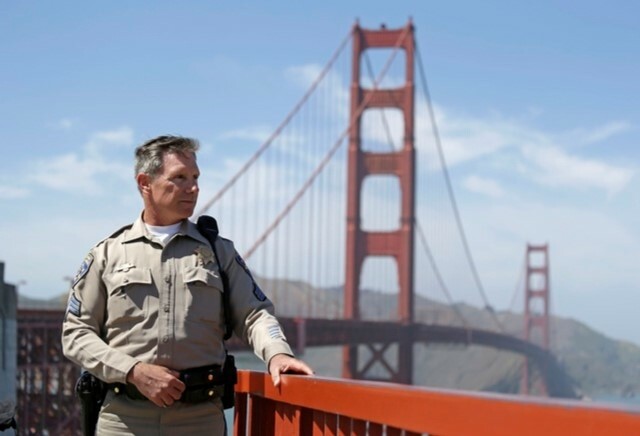 Kevin is a California Highway Patrol officer who has stopped upwards of two hundred people from jumping off of the Golden Gate Bridge into San Francisco Bay. In this interview we find out how Kevin got into this work, the impact it has had on him and Kevin tells us the most memorable moments in the job. The original inteerview can be viewed at ZIDILIFE where Steve and and Christian Sommer interview a whole host of inspiring people. THE FIRST QUESTION I HAVE IS HOW DID YOU END UP PATROLLING THE GOLDEN GATE BRIDGE? WAS THAT A JOB YOU APPLIED FOR, OR DID YOU STUMBLE INTO IT? So you can get the whole picture, I have to go way back to explain my career path. I was working at San Quentin here in Marin County– it’s the only place by law that you can have the Death Row in California. One of the guys I was working with told me about the Highway Patrol and said he was going to apply, and suggested I should apply as well. And I was like “Oh man, I don’t know, those guys are so smart. Every time you see them, their uniforms are pristine they look like the real deal, I’m not sure if I’d get in!” In spite of having doubts, I applied anyway, I made it and he did not. Marin County is where I am from, and that’s just north of the Golden Gate Bridge. When you graduate from the academy you have to spend six months wherever they assign you and I was placed in Hayward, California, it was close enough to Marin so I could drive home but was still a little far out for my liking. At this time they had a hiring and transfer freeze which meant for five years I was stuck at Hayward, but then in 1995 I got my transfer to Marin and specifically the Bridge. I found out really fast that I liked it. I liked the environment, the people were really nice and every day there were all sorts of people from around the world coming to see the Bridge and that fascinated me. Unfortunately, working the Bridge also had a dark side. 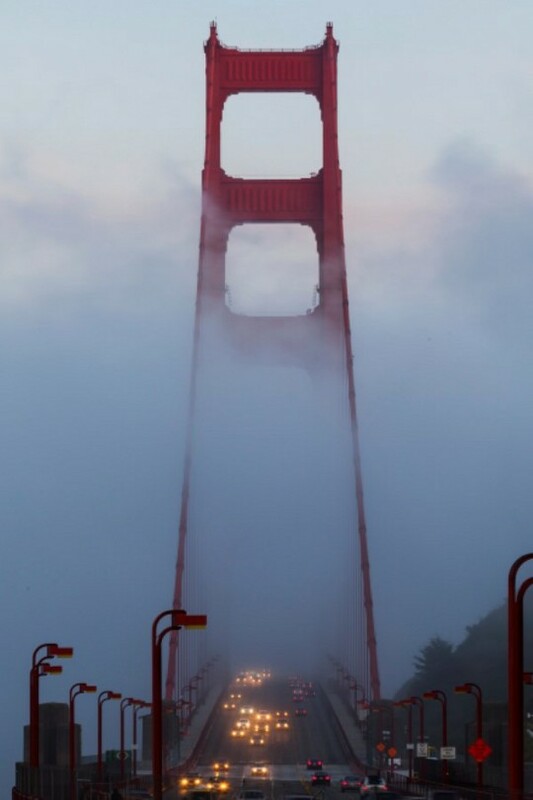 I HAVE BEEN TO GOLDEN GATE BRIDGE MYSELF AND LOVED IT BUT I GUESS IT’S THAT DARK SIDE FOR WHY YOU ARE KNOWN. 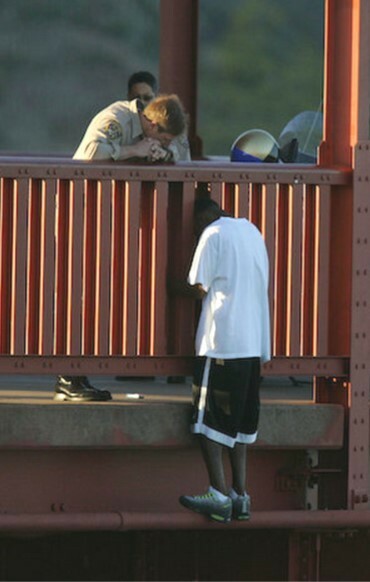 ON AVERAGE HOW MANY SUICIDE ATTEMPTS ARE THERE ON THE BRIDGE IN A MONTH OR A YEAR? When I first worked on the bridge I kept track officers have to write down everything that goes on there. Before 9/11 I was handling 4–6 cases a month. The events included a person completing suicide to interviewing a possible suicidal person that we would be warned about. The number has since grown. AFTER HOW LONG INTO YOUR JOB DID YOU COME ACROSS THE FIRST SUICIDE ATTEMPT? Rather quickly. My first case was actually a completed suicide. An individual, a man, jumped off the bridge but he hit land. He jumped on the north side, where there is a hill, but he did it in the evening when it was very dark and visibility is low, and he hit land. AND I GUESS YOU REMEMBER THAT INCIDENT INCREDIBLY WELL? Yes, I do. It’s very unfortunate. These incidents live with you. Very early on, it became clear how big a part of the job this was going to be and how this beautiful Bridge also had this dark side. I AM TRYING TO PUT MYSELF INTO YOUR SHOES AND IF I’D NOT LONG BEEN WORKING THERE AND SOMETHING LIKE THAT HAPPENED I AM JUST NOT SURE HOW I COULD COME BACK FROM THAT. IT MUST HAVE HAD AN ENORMOUS IMPACT, SO MUCH SO THAT DID IT MAKE YOU QUESTION WHETHER THIS WAS THE JOB FOR YOU? I think because of the jobs I had previously, being in the army corrections, and highway patrol out in Hayward where I’d dealt with car crashes, etc. I was almost used to seeing death. So I think when this event happened I treated it as another type of accident. We as humans, we are not meant to see things like this and it does leave its mark but it also makes you determined that you don’t see these things again, so you do anything you can to help. AND WERE YOU ACTUALLY TALKING TO THE INDIVIDUAL BEFORE HE JUMPED? No. He did it without anybody being around him. Another citizen saw the event, and was instrumental in helping us locate the body. HAD YOU BEEN GIVEN TRAINING ON HOW TO HELP GET PEOPLE DOWN FROM THE BRIDGE SAFELY OR WERE THE TECHNIQUES YOU USED SELF TAUGHT? When I first began I didn’t know of this dark side, nor was I informed of it or trained for it. So it felt pretty crappy. I was thrown into this and quickly realized that I needed some training and I began speaking to veteran officers who had worked at the Bridge to get their advice. They provided me with a lot of assistance and I ended up learning more and more as I progressed, and the more cases I dealt with, the better I think I got at responding. I learned techniques and was forever analyzing my performance. When folks came back from going over the rail at the Bridge, we’d take them to one of the trailers near the Bridge for a more in-depth interview. I always made sure I asked them “What did I do that was right, and what did I do that was wrong?” and I found a lot of insight there. THAT’S FASCINATING. TYPICALLY HOW DO YOU TALK SOMEONE DOWN WHO WANTS TO JUMP? IS THERE A FORMULA/SET OF QUESTIONS YOU TRY AND USE? Each case is unique, but I generally used the same approach and idea. It’s a negotiation. I was negotiating with them to come back over to the safe side of the Bridge. It’s a little bit different than other types of negotiations like bank robberies and the like, but generally the idea is similar. I have found that the most important thing is to do the negotiating one on one to speak to the suicidal person one on one is vital, I believe, and generates the best results. I believe their mind is in such narrow focus, and that they’ve almost got a top spinning in their head with so much stuff running through there, that it is very difficult for them to take a lot in. So I deliberately talk slowly, my conversation with them could be their very last few minutes on Earth and they’ve got a lot going on. What I try and do is be calm - speak softly, slowly and without any desperation in my voice. Even though we’re up on the Bridge and there is a tremendous amount of noise from cars, from wind and that sort of stuff, it’s still important to not raise your voice and alarm the person in any way. I also believe that being below eye level, if at all possible, is important. Fundamentally everything is about them - try and find out about them, and their life. I don’t talk about me and my life, everything is about them. I’ve had a lot of things happen in my life, heart issues, cancer, a suicidal son, a lot of things. So I can relate to some of what these people are experiencing but I don’t talk to them about that because it is not about me. It’s about what is going on with them at that moment, so that I can continue the conversation. Fundamentally everything is about them - try and find out about them, and their life. I don’t talk about me and my life. Everything is about them. AND IS THAT THE KEY? TO KEEP THEM ENGAGED AND TO KEEP THEM SPEAKING IN A PROPER TWO WAY CONVERSATION? Absolutely. Listening is the key to this. Not enough people listen. I was a field training officer for new cadets coming out the Academy for many years and they were full of questions, and so anxious to do things that they would talk all day long but not listen. So what I would tell them is “If you’re talking, and I’m talking, then one of us isn’t listening. I know what I am doing so you need to listen.” And when I am working with a person who is over the rail, I kind of reverse that. If they’re talking then I am absolutely not talking. By listening I can pick up clues as to why these folks are doing what they are doing, and hopefully get a hook so that I can begin to bargain with them. By listening, I am able to ascertain if they are angry or if they’re scared. Almost all are scared and some are incredibly determined and the incredibly determined people are the hardest types to deal with as they just want to see their plan through to completion. HOW LONG CAN YOU BE TALKING TO ONE OF THESE INDIVIDUALS FOR? I have worked on cases from 15 minutes up to eight hours. EIGHT HOURS, WOW. THAT REQUIRES AN AWFUL LOT OF CONCENTRATION ON YOUR PART. Yeah, it really wears you out - both physically and mentally. ARE THERE ANY PARTICULAR INDIVIDUALS AND CONVERSATIONS THAT HAVE HAD A REAL IMPACT ON YOU, AND THAT YOU REMEMBER REALLY WELL? There’s quite a few but an awful lot are blocked out. I will share one with you that happened just before I retired. It happened on July 22, 2013. A young man was over the rail, name of Jason Garber. He was just 32 at the time and he had flown out from New Jersey to go to the Bridge three different times. So he was over the rail, and I was speaking to him, and he was answering almost all of the questions but he was a little different. He was not under the influence of any alcohol or drugs - he was incredibly lucid, when he spoke he was very calm. He struck me as fiercely intelligent. I could tell he was determined. He had his cellphone with him and I could hear he was getting texts and phone calls but he wouldn’t answer them. He was a poet and a writer and was really amazing to speak with. He was very eloquent and after around an hour of talking, he asked me if I knew the story of Pandora’s Box and I said I did. It’s traditionally a story about hope but Jason said “When I open the box, hope is the greatest evil.” In the story, hope is meant to be the only good thing in the box, but when Jason opens the box, hope is the greatest evil. Very, very profound. And with that comment, he leaped off the Bridge. And just a couple of minutes after he leaped, another person leaped on the north part of the bridge. Two deaths in two minutes. So that was a pretty shocking day. DO YOU THEN GET HELP WITH THAT? Yes. A program through the highway patrol is available that helps us deal with the psychological ramifications of this type of event, and as a supervisor I highly recommend it and think it’s vital. You can’t help but remember these days and think about what you could have done better and it’s of big help to prepare for the time you speak to the families. I still wonder how I could have helped Jason more. I actually went and visited the Garber family in New Jersey. I was speaking out in Maryland and the family was having a memorial at the same time, so I rented a car and drove out there. I met with his parents, went for a walk with them and had dinner with them that evening. I wanted closure I guess. I wanted to share with them Jason’s love he felt for them, that he shared with me that day, and I wanted to say sorry. Yes, I don’t think I could have done more but Jason had a big effect on me and I often wonder what I could have done differently. Guilt is a horrible thing. AND WAS THAT TRIP HELPFUL TO YOU? I think it was helpful to everybody in some degree. It was very obvious during my visit that Mr. Garber, Jason’s father, was distraught and his death affected this man severely. WHEN YOU CREATE A RAPPORT WITH SOMEONE, LIKE YOU DID WITH JASON, DOES IT THEN MAKE THEIR SUICIDE EVEN MORE DEVASTATING? COMPARED WITH SOMEONE WHO IS HEAVILY UNDER THE INFLUENCE OF DRUGS OR ALCOHOL AND IS ABUSIVE TO YOU - OBVIOUSLY IT WOULD SADDEN YOU ENORMOUSLY BUT CAN YOU DETACH YOURSELF FROM THOSE CASES MORE EASILY THAN YOU CAN WITH A JASON TYPE OF CASE? Yes, one can detach, but no matter who it is, someone attempting to jump or jumping affects me enormously and the guilt I feel if they jump is massive. I worked with a woman trying to jump while she was trying to stab us with needles - had she jumped I still would have been utterly devastated. When I worked with people who are under the influence, I try to say to them: Do you want be in this state when making a decision like this? I try to get them to understand they can come back any day, but come back when they are sober so they are thinking more clearly. THAT’S REALLY INTERESTING. ONCE YOU’VE COMPLETED YOUR “JOB” AND YOU’VE PERSUADED THEM TO COME BACK OVER THE RAIL TO THE SAFE SIDE - WHAT THEN HAPPENS? This is really what happens - when someone is over that rail and I tell them “When you come back over” -it’s never “if” it is always “when” - people get very concerned about what is going to happen when they come back over. For example, they worry they will be arrested and they’re worried they’ll be embarrassed, as there are pedestrians on the Bridge (even though we keep them away from the immediate area.) And also, when they come back over, then everything that made them cross the rail in the first place - the demons, the issues - they’re all still there. I tell them that they won’t be arrested, that they’ve done nothing wrong, but that I will need to place them in handcuffs for their own safety, and that I will be taking them to a hospital. But if I’ve told them we are getting a cup of coffee, then we’re getting a cup of coffee. And if I have told them we are getting a hamburger, then we’re getting a hamburger. AND IS THAT THEN THE END OF YOUR INVOLVEMENT WITH THEM, OR WILL YOU CHECK UP ON THEM TO SEE HOW THEY ARE? From my side, that is the end of my involvement. However, if they want to contact me, they can as my number is in the office and available to them. I don’t contact them because they may not want to relive the event, it could be a trigger so I step back and let them get on with their lives but I am always available should they wish to talk. It’s so important you don’t break that trust you’ve built, because if they decide to do it again, and another officer is dealing with them and I’ve let them down, then that officer hasn’t got a chance. Trust is so important. HOW MANY PEOPLE HAVE COMMITTED SUICIDE THAT YOU HAVE BEEN TALKING DIRECTLY TO? Of all the cases I’ve been the number one negotiator on, I have lost two. I have lost others where I have been assisting. THAT’S AN INCREDIBLE SUCCESS RATE IF YOU’VE ONLY LOST TWO BUT ARE GETTING FOUR - SIX CASES A MONTH. HOW DID THAT FIRST INCIDENT AFFECT YOU? I remember it very well. It was an African American man, mid thirties, and he wouldn’t give us his name. And I say “us” because I think this is where we fouled up. It was me and two other officers speaking with this man, and this is where I think we went wrong. This event is why I now insist on working one on one. It may have ended up with the same result but I felt that with three of us speaking (not all at once) it diverted his attention. This man was not under the influence, he was nicely dressed and in speaking with him, he kept telling me his “Grandmother was down there” so he shook my hand (which officers are not meant to do) and he said “Kevin, thank you for everything but I’ve got to go and be with my Grandmother now” and he jumped. OH MAN. THAT’S AWFUL. DO YOU TURN YOUR BACK AT THAT POINT? No, I didn’t. I have been taught that if you watch someone fall, that can have a harder affect on you. I watch because I want to mark the body in the water so it can be retrieved by the U.S. Coast Guard. I can still see him hitting the water. There was a lot of blame I put on myself for that case and it was tough to come back from. But you have to come back because we could lose more people and that would be such a tragedy. So many of those that go out on to that rail have such an enormous amount to offer. It’s my duty to ensure their safety and let them share their gifts with the world. So actually by looking at him hit the water it makes you never, ever, want to see it again?—?so it gives you that determination. But you have to come back because we could lose more people and that would be such a tragedy. So many of those that go out on to that rail have such an enormous amount to offer. It’s my duty to ensure their safety and let them share their gifts with the world. So actually by looking at him hit the water it makes you never, ever, want to see it again – so it gives you that determination. THAT’S INCREDIBLE. WHAT AN ATTITUDE TO HAVE. I READ THAT YOU HAD CANCER AT TWENTY, HAS THIS AND OTHER EXPERIENCES IN YOUR LIFE HELPED YOU IN THIS JOB DO YOU THINK? Yeah I think it has helped. I went through some very intense chemo and went from 170 to 130 pounds. I lost all my hair, I was throwing up all the time, I became depressed - it was a horrible time. It definitely takes its toll but walking out of that hospital I think I realized the beauty of life, I appreciated everything more, so I think that’s why I try so hard trying to prolong other people’s lives. SO THIS JOB WAS ALMOST MEANT TO BE IT SOUNDS LIKE. Yes, I am very happy that I’ve been able to help people and be some sort of assistance. I GUESS YOU MUST TAKE THIS WORK HOME WITH YOU? Yes, straight out yes. I have been told as much. Other people have told me I have a lot of signs of PTSD. I’ve been diagnosed with depression, had three heart surgeries, a nasty divorce and one of my sons was suicidal - so I often wonder what the impact of my work has been not only on myself, but those I love around me. I am working very hard on getting that balance and being a better father and leading a more balanced life. IN YOUR TIME DOING THIS JOB, AND LATTERLY PIVOTAL POINTS, ARE PEOPLE’S GENERAL ATTITUDES TOWARD MENTAL HEALTH BETTER? IS IT NOW LESS TABOO AND MORE UNDERSTOOD DO YOU THINK? Absolutely. It’s becoming easier to speak about and it seems it is being accepted more. For example I spoke at a high school the other week and many of these kids wanted to speak about the subject - even the football players. No longer is it a subject that is off the table, people want to talk about it and getting it in the open. PEOPLE LIKE YOU ARE HELPING WITH THAT. HYPOTHETICALLY, IF I HAVE A FRIEND WHO IS FEELING SUICIDAL AND I PICK UP ON IT FROM CONVERSATIONS I HAVE HAD WITH THEM WHAT SHOULD I DO, DO YOU THINK? DO I APPROACH THEM ABOUT IT? I AM ASKING BECAUSE SOME PEOPLE READING THIS INTERVIEW MAY HAVE THAT TYPE OF FRIEND OR FAMILY MEMBER THAT THEY ARE CONCERNED ABOUT AND WANT ADVICE. It’s an excellent question. In my opinion you HAVE to confront them on it. Who confronts them on it is another thing to think about. Who has the best rapport with that individual? If it is a parent and a child relationship it may not be a good fit for the parent to confront them, it may be better for a teacher or for a friend and that decision is an important one. But I am a huge believer in a one on one, rather than an intervention style group confrontation. It should be one on one in a place where the person you are confronting feels utterly safe and comfortable, because they may break down. So in my view the first thing to do is you need to try and understand if it is a bad few days, or are they particularly down because there been a moment like them getting fired or something, or have they felt incredibly low for a long period of time and having suicidal thoughts? Because we want to get to the bottom of that. And I think you have to be direct - “I have seen how much pain you are in. Have you had thoughts of killing yourself?” - you have to be direct. You have to be prepared for them to say yes and know what resources you have access to. You need to know what you would do in that situation. Are you going to freak out and start screaming at them, which would damage that rapport irreversibly? Instead, take a step back and ask how long they’ve had these thoughts, have they tried it before, what stopped them? This is known as the hook - the thing that keeps them alive. Once you have some of this information you then need to take them to a behavioral health or medical care provider, or even a hospital to get proper care and help. So call the police, an ambulance, a doctor - whatever it is they need to get help and that help has to come to them because you can’t leave that person alone. THAT’S GREAT ADVICE. THANK YOU. YOU’VE RECENTLY LEFT YOUR JOB [TWO YEARS AGO] TO SET UP PIVOTAL POINTS - CAN YOU TELL OUR READERS A LITTLE ABOUT THAT PLEASE, AND WHAT IT IS AIMING TO DO? I retired in 2013 to create the company to teach and spread crisis management - communication wise. How can we talk to each other when things are so emotional and get to the point where we can move forward and make things happen? I have a lot of experience I think in crisis management that can be useful for other people, in all walks of life. THANKS SO MUCH FOR TALKING WITH ME TODAY KEVIN. No worries Steve, thank you so much for asking me to share my story. I love what you are doing and am delighted to be able to share my story. If you enjoyed Kevin's interview then you may want to check out his TED talk which can be watched below. "I'm the only person of distinction who has ever had a depression named for him." "I'm what you call a Depression sailor." "Just like other illnesses, depression can be treated so that people can live happy, active lives." "Coming down off crack is like the worst depression. The worst." "I didn't feel the Depression at all. I always had a pocketful of money." "I have suffered from depression for most of my life. It is an illness." "I can certainly see how people are overcome by depression."